Graduating from Wayne State with a BFA in Graphic Design, Dawn Rivera has always had a passion for all types of art while growing up in Michigan. 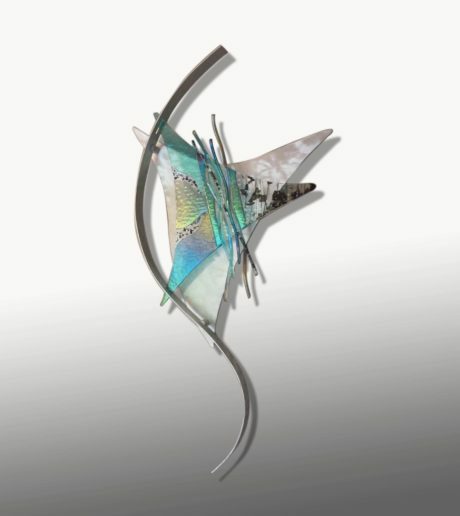 Her dad taught her stained and blown glass, but after taking 1 fused glass class with him she knew she found her medium. Working in the corporate world she sought a way to channel the stress from the field into a creative outlet. Glass fusing soon became her hobby and filled an artistic void and promoted self-expression. She has spent over 10 years being self taught and honing her craft. Dawn started out making functional art like cheese plates and bowls but now is focusing on incorporating metal with her glass in making abstract sculptures and wall art. She shows her artwork in galleries in Kentucky, Michigan, and Indiana and is hoping to add more states in the future. Her inspiration comes from all around her and she loves that she is always learning something new and sometimes mistakes actually aren’t really that, they’re more like happy surprises.